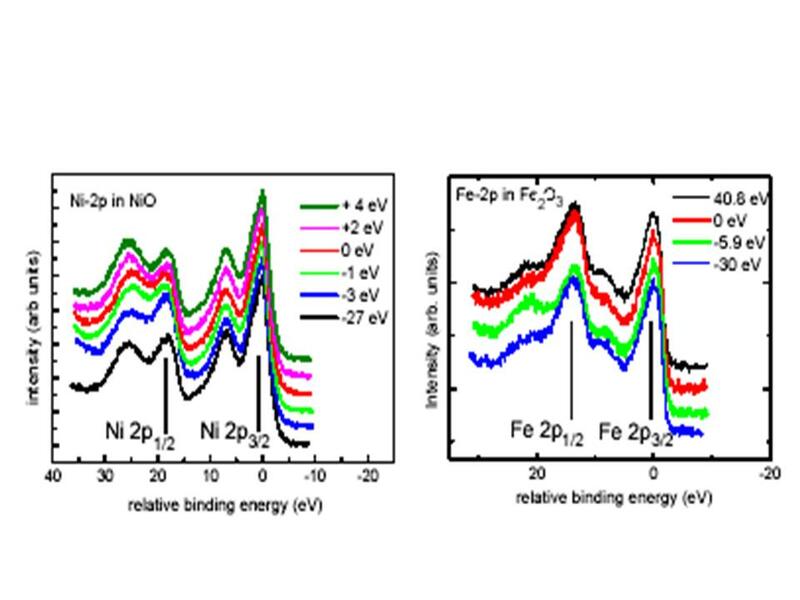 Fig.1: resonant XPS spectra in NiO (left) and Fe2O3 (right)recorded for the indicated photon energies across the Ni K-edge (left)and Fe-K edge (right). The photon energies are given with respect to the maximum of the white line. The spectra are normalized to the maximum of the 2p3/2 line. K-edge X-ray absorption and 2p-XPS spectra of 3d-element oxides present spectral features which cannot be explained within a simple one-electron model. These features reveal the fine electronic structure of transition metal (TM) oxides valence states resulting from hybridized TM-3d and O-2p states, and the correlations between these valence electrons. Resonant electronic spectroscopy (resonant Auger or resonant photoelectron spectroscopy) around the TM K-edge can be used to interpret the structures of the threshold and, with the help of theoretical calculations, to determine the electronic configuration of the excited ion. For example, 1s->3d quadrupolar transitions are detected and discriminated from dipolar contributions in the titanium K-edge absorption pre-peaks in TiO2  and in the Ni K-edge prepeaks in NiO thanks to resonant KLL Auger spectra. The experimental results obtained on Ti K-edge are successfully reproduced by theoretical calculations , making the determination of some electronic parameters possible from experimental data. Information for the assignment of fine structure in the absorption can be also deduced from hard X-ray resonant XPS. This has been demonstrated at the L3 edge of intermediate valence Ce compounds where the contributions of the 4f0, 4f1 and 4f2 electronic configurations have been located by resonant Ce-3d photoelectron spectroscopy. In 3d-TM oxides, the 2p-XPS spectra also contain valuable information. The main line can be split into two components (like in NiO) revealing non-local core hole screening effects and satellites appear due to the different valence configurations. Can these spectral features be used to explore the electronic configurations of the different final states reached through the absorption edge? To explore this possibility, we have studied the resonance of 2p-XPS around the TM K-edge in NiO and Fe2O3 (Fig. 1). One observes the same behaviour on the two samples: the relative intensity of the 2p1/2 main peak resonates at a photon energy below the white line (maximum of the absorption) (at -3 eV for NiO and -5 eV for Fe2O3), and the 2p1/2 satellite is maximum for a photon energy slightly higher than the white line. The resonant effects are more pronounced on NiO than on Fe2O3, and no resonant effects are observed on TiO2 around the Ti K edge. This can be related to higher localisation of valence electron as the number of 3d electrons is increased, and a more “atomic-like” behaviour.